Google crawls all of the links on your site. That means links to both internal and external content count toward SEO. Learn how to create links to ensure you are properly passing “Google juice” or not. And, discover how to boost your own site’s SEO too. Links are the very heart of Google’s search engine success. Google discovers new sites by crawling links on sites it already knows about. It’s also how Google sorts out what pages are important on your site. If you are internally linking to prime pages on your own site, Google is going to get the idea those pages are important. Internal linking on your own site improves your SEO. Anything you can do to help Google understand more about your site is good for you both. That’s why I teach ALL of the internal linking spots (way beyond just your content) in my SEO Workshops. When you link to another site, Google assumes that you are voting for that content as something worth knowing about unless you tell it otherwise. In SEO industry jargon, that vote means you are passing link juice or Google juice to the other site. If enough other folks do the same, Google assumes the content on that other site has authority on topic. Google will rank it higher in search than similar content on other sites. You can tell Google how to regard links on your site by adding special directives to the links. These directives are hidden code tags that have to be manually added to text links in your content. You can also add these special directives to pages and posts on your site. More on that in a moment. Following are the directives you can add to text and image links on your site, how Google will treat them, and when you want to use them. This is the default directive for links. In fact, no extra tag has to be added. Google bots assume that you want them to discover where the link leads, so it follows it. DoFollow links also pass Google link juice, meaning that Google counts it as a vote for the site being linked to. In SEO jargon, it is considered an inbound link or backlink, because sites are linking back to it. The more backlinks a site has, the more authoritative Google considers it. That is why inbound marketing and backlinks are so prized. It’s also why some site owners buy backlinks, which is a practice Google frowns upon. But, it is how scammy SEO companies get fast results for their clients. This practice is called black hat SEO. Unfortunately, Google will eventually figure out what’s going on and penalize the site receiving all those backlinks from bogus or scammy sites. So, it works for a while, but the penalties assessed later are severe and hard and costly to recover from. Organic backlinks, or those that occur naturally, are what Google favors and rewards. Those organic backlinks are also why I get a dozen emails each week from bloggers I don’t know, pitching me their articles for inclusion in the Tips Tuesday podcast and post. BlogAid is a reputable and authoritative site. And links in Tips Tuesday are DoFollow. Everybody wants to share in my good name. This directive tells Google that you don’t want it to pass link juice to the other site and that you are not voting for that site. Google bots will make note of the other site, but they will not follow that link and count it as a vote from you. You must manually add the rel=”nofollow” attribute. Some plugins make all links NoFollow. Be careful with this all-or-nothing method. It may make all of your internal links to your own site pages NoFollow as well. If you go this route, be sure to select a plugin that has an option to make only outbound/external links NoFollow. And perhaps include an option to override that directive at will. Another example on why I don’t use this method is that I have multiple member sites that have their own sub-domains and would want to pass link juice on those outbound links from BlogAid. So, I wouldn’t want to make all outbound links NoFollow. Some plugins enhance the text editor with an interface to either manually add the NoFollow attribute or to click a checkbox so it adds the code for you. The native WordPress link editor and the TinyMCE Advanced plugin editor may be able to help you create nofollow links. All links left in blog comments are NoFollow by default. This directive was added to WordPress in an attempt to foil spammers, but it sure hasn’t stopped them from trying!!! A comment spam filter plugin is the only thing that seems to keep them in check. 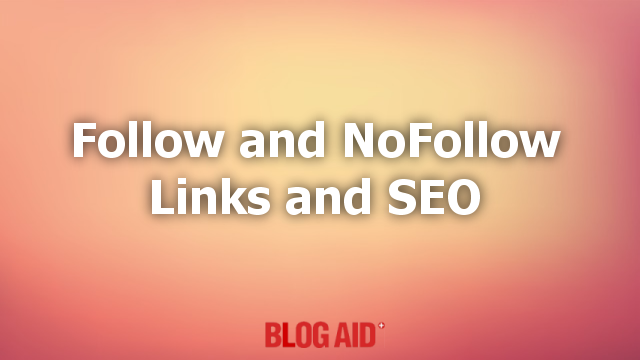 The most common use for NoFollow is on links for ads. You generally don’t want to pass link juice to affiliate links either. Most ad networks take care of the NoFollow attribute for you. But you’ll want to consider adding it if you manually create the ad, such as using your own image for it. It’s worth noting that you don’t have to make affiliate links NoFollow. It’s just that most site owners do. Some SEOs assert that Google has recently started counting NoFollow links as a vote. Some also assert that where the link appears on the page/post influences its weight. So, the higher up it is on the page, the more weight it carries. There isn’t a lot of hard evidence to back up these claims yet. And Google moves the cheese all the time. So, what’s true today may not be true tomorrow and it’s hard to build an SEO strategy on this kind of shifting sand. In other words, follow the general advice here about DoFollow and NoFollow and don’t worry too much about how Google will move the cheese next on these fuzzy SEO tactics. You can also make the pages on your site DoFollow and NoFollow, and include other directives about whether Google indexes them or not, and whether they should be included in your XML Sitemap. Subscribe to BlogAid News and all posts so you never miss tips and tutorials like this. I see so many people giving advice on this topic. You have explained it so everyone should be able to understand the difference and not be confused. Thanks Debra. With all things SEO related, if you ask 10 SEOers, you’ll get 6 different answers. There are bunches of articles out there advising how to use them without ever really explaining what they are. Glad this was helpful. MaAnna…thanks for this informative post. Clear explanation with lots of detail…that’s what I like. I never knew that links in blog comments are NoFollow by default…that’s very interesting…and it’s weird that spammers don’t seem to know this? I mean…you would that knowing this would cause them to cut back on their comment spamming. Yeah, Christian, there is a lot to links!!! The more we know, the better we can help our SEO. Glad you enjoyed the post!! Thank you MaAnna, for expanding on the question I asked, and explaining so clearly. Another example of the great value of your SEO Workshop… a whole post dedicated to a participant’s question! And everyone gets to benefit too. I’m so glad you asked, Tina!!! If you want to know, others do too. And showing examples with deeper explanations in a post is a great way to help everyone. Great explained about dofollow and nofollow links.